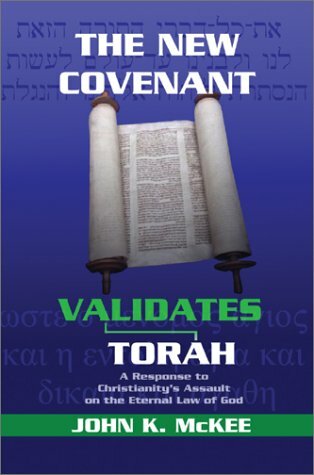 The New Covenant Validates Torah is a study that we all need. Many Messianic Believers know that we should honor the Torah of Moses and that it is eternal as Yeshua (Jesus) told us. Yet, many of us cannot readiliy respond to the antinomian claims of many churchmen and their manipulation of Holy Scripture to prove that the Law has been "done away." TNN Online editor John McKee addresses many of the claims given as to why we should honor the Torah. He addresses how the inspired Greek Scriptures, particularly the writings of Paul, admonish us to honor YHVH's Eternal Instruction. The New Covenant Validates Torah is a point-by-point response of a pastor's paper. It is an excellent tool to have when confronting antinomian Christians. J.K. McKee (B.A., University of Oklahoma; M.A., Asbury Theological Seminary) is the editor of TNN Online (tnnonline.net) and is a Messianic apologist. He is a 2009 recipient of the Zondervan Biblical Languages Award for Greek. He is author of numerous books, dealing with a wide range of topics that are important for today's Messianic Believers. He has also written many articles on theological issues, and is presently focusing his attention on Messianic commentaries of various books of the Bible.